Last week I shared with you some of my thoughts following a 4-day conference I attended discussing organic churches. Many of you had questions regarding the actual model and structure of an organic church. I thought I’d try my best to address those questions. Firstly, let me state that while I tend to use the terms “house church” and “organic church” interchangeably, many who take part in organic church do not. The distinction they draw is that house churches are usually just shrunken, smaller versions of a Sunday morning service. Organic churches, on the other hand, are something all together different. For starters organic churches do not have a pastor. That’s right. There is no one guy and no one leader. Sound weird? Well, it is. I thought so. When my husband and I read about not having an actual leader of any kind, it took us by surprise, but then…we got excited. “Of course,” we thought. This makes sense to us. Yes, leaders will naturally evolve in any group. Leadership is a spiritual gift after all, but the practical reasoning behind not assigning a leader is a huge one. 1. If there’s no leader, then the church can operate essentially the same each time they gather. In other words, the health and vitality of the group is not dependent on a sole individual, as is the case for most traditional Sunday churches. People show up to see the pastor preach, not to meet the guy next to them in the pew. This also means that individuals spiritual gifts can function naturally and freely. The hand can be a hand. They eye can be an eye. 2. Secondly, and more importantly, if there is no head pastor or leader, then Jesus Christ can truly operate as the Head and not a man who preaches or leads worship on Sundays. This alone makes organic churches vastly different and unique. Although I should mention that this model was not “unique” in the early church. This model was the early church. We gather together in a home (my home actually). Although, as Frank Viola has stated, there is nothing spiritual about a living room. Some organic churches meet in schools, other church buildings,, etc. We eat food. Always. We start with a meal because we think food is an integral part of a healthy family. We then round up the children int another area of the house. Usually one of the adult rotates in with the kids. We have a “kid kit” complete with lessons, crafts, activities and DVDs. The adults gather and pretty much use 1Corinthians 14:26 as our guide. When you come together, each of you has a hymn, or a word of instruction, a revelation, a tongue or an interpretation. Everything must be done so that the church may be built up. This means everyone participates. Everyone comes prepared to add to the time. Everyone is made to feel and eventually believe that they are a necessary and valuable part of the body. Sometimes we worship. Sometimes we don’t. Sometimes we pray as a group, sometimes as individuals, sometimes just the woman pray together and the men pray together. There is no “one guy”, no head pastor. We each express our spiritual gifts freely because the organic church model makes it so easy to do so. There is a shepherd in our group (my husband). He shepherds, which is not the same as preaching from a pulpit on Sunday morning. We have a prophet in our group, as well as an evangelist, a teacher, a leader, and a few exhorters. We desperately need an administrator though. We are also working on spending time as a church family outside of our Sunday meeting. Church life is shared life, which means, if you are only meeting once a week, then you are not experiencing organic church life. We are still figuring out how you practically and spiritually we make Christ the Head, instead of a man. Churches are often good at making Christ their Lord, but not necessarily their Head. It is a new concept for me personally to be practicing, not just discussing in theory. God has much to show us, but He has already been so faithful to us as we pursue this new and adventurous way of being the Body. I know He will provide us with all we need to pursue Him in this new way. So what do you think? Does this model appeal to you, why or why not? Would you ever consider participating in an organic church? What does your current church do well that you appreciate? Seriously though, I have an ongoing discussion going in my head about these kinds of things. I’m becoming convinced that the whole idea of church is getting lost in the clutter of 501(c)(3) corporations, facilities, clergy, etc. Somehow the support of all of those things drains all of our resources, and in the process, the real needs that real people have tend to fall between the cracks. I think a new model is definitely needed. The one you describe is certainly worth a look. I really would encourage you to research the organic church model if at all interested. Frank Viola’s site is a great place to start. His blog is full of information. He has also published many books, a few of which specifically discuss the organic church movement. The Church gets trendy sometimes. “Missional” groups are trendy right now. I think they are good, but I also think they fall short. The organic church model is the picture of the Body as described in Acts…and that is exciting! I’m intrigued by concept. I’ve heard of house churches and cell churches but “organic church” is new. So, would this make you an independent church or part of a church or denomination? Where did you get the kid-kit? Do you have mentors or coach to help you along with this process? How/where do you tithe? Wouldn’t the group always be “dysfunctional” (lack of better word) since you don’t fully have all the “body parts” to function as a body? For example, what if you don’t have a mouth or an eye? Sorry for the many questions. Just bought the book by Frank Viola but haven’t had a chance to read it yet. We are an autonomous organic church not affilited with any denomination or other church body. The vision God has given us is to form a network of autonomous organic churches that would then meet corporately in and throughout the city. The “kid kit” we made ourselves. A member of our body who has a love for children and used to be a teacher constructed the kit. She was able to use her talent and passion to bless our body. We do not have a mentor or coach. Although Frank Viola’s ministry does offer apostles who travels the U.S. to help establish and begin organic churches. Tithing is a great question. We have yet to take a tithe in our group. However, we do have specific protocol for tithing in our church documentation. If you are interested, my husband could email you that information. As for the church being “dysfunctional” if it is lacking all of the parts, what does that say about a traditional Sunday setting where gifts are hardly ever addressed, let alone practiced? Practically speaking, I don;t know that any one organic church will always be an equal representation of each and every spiritual gift. I do trust, however, that the Lord would bring the right balance of gifts to a particular body. More than that, you can certainly pray that the Spirit would bring to your body whatever gift is lacking. I would encourage you to check our Frank Viola’s blog, as well. He has tons of info and resources to peruse. Thank you for the thoughtful, practical questions. Viola’s book “Pagan Christianity” is a good start as it covers the birth of many of the traditional church practices. This book has about 9000 footnotes and is more of a nuts and bolts type “study’ of modern church practice, not an Organic church manual. I would also suggest a blog and books by Keith Giles (formerly Subversive Underground). He is totally covering many of the subjects/questions concerning Organic Church. BTW Giles is a member of an Organic church and they give 100% of their offering and use none to administrate. Study tithing in the New Testament as well. I guess I have been quite fortunate that I attend a church were we created those bonds through fellowship (which is what we call what you described). We have forged relationships that extend outside of the church. We eat, go out, go to the movies, celebrate life events, etc. Even though we have one shepherd, many people preach and others fulfill their calling. So we all “stay in our lane” so that our gift is nurtured and allowed to grow.i say if it works for you may God continue to shower down his blessings upon it!!! I’ve been thinking a lot lately about what church is and what church should be lately. I want to be part of a church where I just don’t go to services with my church friends. I want to eat with them. I want to watch my favorite television shows with them. I want to play board games with them. I want to go on walks with thems. I read your comments with both a smile and a little sadness. It’s funny, isn’t it? Sometimes folks get so wrapped up in “doing church” they forget to schedule the time to “be The Church”. The good news is, you are already part of The Church of Jesus, the One He is building. The Church that matters. All that other stuff is just man’s commentary. I’m fortunate enough to have people who “are the Church” with me. The ironic thing is we’ve never even attended a church service together. You are a blessed man, indeed! I checked out your post and you are asking the right questions. I wish more in the Church asked those kinds of questions. I pray God will bring you to a place of fulfillment within His Body, whatever model or form that may take. I know I may sound like a broken record, but I would highly encourage you to read Re-imagining Church by Frank Viola. It will set your heart and mind aflame for a new church experience–the kind you are craving and describing. Well, Amazon has Re-imagining Church on sale for the Kindle for $1.99. That made it easy for me to buy! I’ve been questioning many things lately… Church, Spiritual Gifts and Grace, etc… When I go to the Bible for the answers, I find out I’ve been taught wrong most of my life. “I can feel a strong presence of God in this place tonight.” I just want to raise my hand and ask a lot of questions: Does God ever have a weak presence? Is he ever not here? Why does it matter if you feel it? Is it only true to you if you feel it? Nicole, I haven’t began Re-Imagining Church yet. I did start listening to Pagan Christianity today. I’ve made it through the first chapter. I have many more questions that I didn’t post (would have caused quite a stir if the wrong people saw them). I believe God’s Word is true, but many of my church experiences haven’t lined up with that. Thank you for your prayer. I hope I have the opportunity to meet you and your husband some day. I’ve been drawn to this type of church for quite some time – where everyone is responsible to use their giftings (both spiritual gifts and natural abilities) to edify the body as a whole. The thing I feel about it is that it allows everyone to feel needed, and learn to be responsible for their own growth, instead of expecting a pastor to “feed” them. My church is in a state of flux – we’ve been doing the “traditional” model of church and losing people rapidly. Our pastor wants to change things radically, and I’m trying to suggest this type of church, where Jesus is the Head and we’re guided by the Holy Spirit rather than a prescribed way of doing things, where everyone is needed and included. I don’t know what exactly is going to happen, but my prayer is we move into a true experience of relationship with God and with each other. We’re also in a state-of-flux with our children’s ministry – meaning no one wants to do it, and it’s become babysitting instead of pouring into the lives of kids. God is pushing me to step in – and I SO don’t want to! But I’d rather do what God’s telling me to do than be disobedient! While it sounds somewhat difficult and even painful, what an exciting time for your church! I will be praying that the model, form, and function that GOD would have for your church would make itself known and take over. May God reward your obedience too as you step into something you would not necessarily choose! Like my flinching when I hear the word “church” bantered about, I also flinch when I hear or see the word “pastor”, especially if it has a capital “P”. I much prefer ekklesia to church, and shepherd to pastor. It’s just a thing I have with the meanings of words. We both now ‘church’ and ‘pastor’ have been hijacked by religious christianity and those who treat The Bride as a source of employment. There IS a better way. There IS a way to have a local gathering of Spirit-led believers who simply want to….wait for it…meet together and follow 1 Corinthians 14:26. There is. You now of it. You are doing it. Someday I will be, as well. Someday The Church will be totally unrecognizable by modern standards of religious practice and cliched christianity. The best thing about Jesus being the Pastor of The Church is that he doesn’t let you down. I’m not trying to bash vocational pastors, because I know they’re human. I’ve just seen so many pastors put put on a pedestal. Their sin is revealed, and then the entire church falls apart. “Pastor”, to me, is more a verb than a noun. Hence, the man who pastors me is just that: he pastors me. He is not a “Pastor”. He shepherds me. He is Paul to my Timothy. It is a great arrangement. Sadly I must agree with you regarding the troubles a local body faces when they step away from calling and make it about a career. Your comment just got me fired up! You so get it Donald. I know God is leading you in this direction! I cannot wait to hear your testimonies about what God is doing. P.S. There is always room for another prophet, but 2 may be my cap. Love those prophets, but too many can be….um, hard to swallow. wink wink. Those silly prophets, what with their whole ‘Holiness of God the Father’ and ‘The Truth of The Scriptures’ stuff going on…yeesh! Freaks! two prophets in the room might be your cap, but Paul considered prophets to be providing the second-most important gift to the church (1Cor 12:28) and he expected that there would be at least 2 or 3 in the room ready to speak, with other prophets handy to judge the accuracy of the messages (1Cor 14:29). Most institutional churches today fear prophets (not in a healthy way) and try to keep them silent. That’s why most of these man-run organizations have officially filed for non-prophet status! Well, it’s been working for us for like 5 years now. The best thing I’ve ever done with the word “Church” on it! Awesome! Tell me more! Where do you meet…city and sate? What are some challenges you have faced? I’d love to chat. How freaky I just posted a comment and recommended your blog and books about 2 min ago and scrolled on down to find your comment. I also told my wife today how I wish you were closer so I could talk to you in person on a regular basis. Stellar. I am on the fence. On the one hand, the Church has completely abused the position of “Head Pastor” to create god-men in our midst. That way, they can do the spiritual stuff and we can just, as you said, “be fed”. So that doesn’t work. But I have a problem with the whole no-leader thing; mostly because I see God use leaders from the start. It’s true that the early Church had a family type environment. But there were leaders. Not senior pastors, but elders and deacons and apostles. They were people who God used for a his purposes. In fact, every story I can remember in the Bible was facilitated by some kind of leader that God chose to work through – Daniel, David, Moses, Elijah, Paul, Jesus, Peter, Aaron, Joshua, Ester, and on and on… I don’t think the problem is having a leader, I think the problem is in what we perceive a leader should be. We think a leader should be the star, the general, the hero. But really a godly leader is one, like a Shepard, who leads God’s people in a way in which all can contribute and be the body. So, while I like the idea of the “organic church”, I oppose the idea of a leaderless group. But, I can say in all honesty, I truly am praying for you and am excited to see what happens with your organic church. If organic church is the right thing, there isn’t anyone more qualified to see it through and bear fruit than you can Jonathan. I think there is SO much of what you are doing that is right and I am eager with anticipation to see the Kingdom fruit that is grown. God Bless! All due respect, this simply is not true when you read Acts, especially Acts 1 and 15. See also 1 Timothy 3. Authority was very important in the early church. It just was. I don’t dispute the fact that the Church very much needs leaders and those in authority. Elders, deacons, and apostles help fulfill those roles in the organic church setting. To be clear though, even the early churches that Paul helped establish did not have elders immediately. Many did not have some for years in fact. Paul cautioned about choosing the right men, not just men to fill those roles. Our church has been meeting for a little over 5 months and we are prayerfully considering the men who will become elders in our church body. Also, again I have to stress the difference between headship and leadership. A church operating under the headship of Christ is quite different than a church operating under the headship of an executive pastor. Organic church is devoid of hierarchical-leadership, not all leadership. This is a key distinction. “Organic church life is a grass roots experience that is marked by face-to-face community, every-member functioning, open-participatory meetings (opposed to pastor-to-pew services), non-hierarchical leadership, and the centrality and supremacy of Jesus Christ as the functional Leader and Head of the gathering. If that ain’t Church, I don’t know what is. I look forward to the post on your blog regarding this topic. i’m intrigued by much of this discussion . you talk about non-hierarchical leadership, but then it sounds like you only want men as elders. that sounds a great deal more hierarchical than many institutional churches. am i reading you wrong? Matt…you big teaser. This convo was getting so wonderfully rich and deep…. *sigh* Fine. I reckon we’ll have to wait. I completely agree with you! I never said the organic church is void of leadership, it is simply not the hierarchical-leadership that we are accustom to. Leaders will naturally arise, which I even say in this post. But again, we are not talking about a Head Pastor. Certainly, if we recognize that God is a God of order, not chaos, then we understand that even a small group of believers meeting still needs leadership. All that to say, experiencing Christ as the true Head is a new concept for me. I have been challenged and excited watching and allowing Him to hold that position. It takes practice. We know as believers that Christ is our Head, yet we rarely allow Him to operate as such within His own Body. Thank you for your words of encouragement as well. We are blessed by your family’s love, support, prayers and true friendship. great post, nicole. it’s very encouraging to hear about christians’ practical efforts to be more organic. you mentioned still searching for ways to ensure that Christ is the head and not man. you didn’t actually ask for advice in that area, so this may be unwanted, but i’ll offer it just the same. have you guys ever looked into 3-column bible (inductive) study? both of these ideas involve reading the word of God together, ensuring that we truly understand it, asking what we learn about God and his desires for mankind, and (perhaps most important) stating how we will each be obedient to the teachings of Christ. there is also some emphasis placed on sharing what we learn with others during the week. anyway, just something to think about. I like your blog, I read it pretty regularly. We are in Phoenix too (Chandler actually). I’m part of a church plant in Tempe. It sounds to me like you guys planted (or are planting a church too). Aren’t they all organic? I love my church, they are the most wonderful group of radical Jesus loving people I’ve ever met and God is adding to our midst daily through radical surrender to Jesus. There is a freshness and realness in the people there that can only be credited to a real and living God breathing new life in people and working through them, and that’s 6 out of 7 days of the week. On Sunday’s we come together and celebrate all that he is doing. I look forward to Sunday, the way my son looks forward to parties! Without publishing a complete treatise on the matter, let me offer this thought for those concerned about leadership in the church. The NT church undeniably has a hierarchical authority structure. Jesus is the head. Apostles and elders are all together at the next level of authority (Acts 15 serves as an example), overseeing the “spiritual” movement of the church. Deacons (Acts 6) come in at level 3, supervising the “practical” workings of the church. That’s it–three levels. That’s what the Bible tells us. Men have created lots of levels that are not only unbiblical, but they hinder the work Christ has given the Church to do. You should also notice that I have been explaining the hierarchy of “authority” and not “leadership”. There is a huge distinction between the two. Sadly, institutional churches have lost the understanding of that distinction and have created a clergy-laity division that is absent from the NT. Professionals have come to run the churches and to exercise their gifts and desires, leaving the rest of the people to sit and listen and to pay for the privilege. It is both sad and disgusting. Jesus is the functional leader of our House Church. We listen to Him and seek to follow His leading as directed by His Holy Spirit. It is exciting. Each person has opportunities to speak and to participate in various ways. Yes, we have a qualified elder overseeing the group (much of the time), but that role of authority has rarely been used–perhaps twice in 7 years. We all can use our gifts to serve the Lord and to serve one another. The Spirit may speak through any member to “lead” the discussion and ministry that is going on. That leadership is not dependent upon a designated role or office of authority, but just by following Jesus, and helping the rest of us to get in line behind Him. According to Ephesians 4:11-16, gifted leaders have the responsibility to equip the rest of the people to do ministry themselves. Spiritual work is not supposed to be reserved for the few, but experienced and practiced by all. Wise leaders train others and then get out of the way. And a House Church or Organic Church (or whatever name you want to call it) is an ideal place for all of us to practice exercising ministry to the Lord and to His people. I see a lot of people advocating for this model and speaking into reasons as how ‘traditional churches’ got it all wrong. I see the word majority used a lot. I am going to keep in mind that majority is 50% +1. I am sincerely sorry that so many of you have been burned by churches so bad. But when I see the conclusion that you all come to about the decision do “organic church,” I still have yet to see anyone say how this benefits outreach and envangelism. Maybe you are right in that all ‘traditional’ models of church are wrong and yours is right. That’s fine, that’s not what I am discussing. But I want some tangibles. What are you doing to actively reach people with the Gospel? You keep talking about meeting together and fulfilling all these roles and using all these gifts but there is no mention of going out and reaching people. I am not trying to argue, I really am not. I just don’t see how this is any different from the 7,236 denominations we already have within Christianity. I know your model is very different in the execution of how you do church but isn’t that the very core of why denominations even exist? I have been praying very specifically for this online community and whomever is connected to it because I want to see people live out authentic faith and I pray that this model helps you do that. The Church in and of itself does not have it as its responsibility to outreach or evangelize. We, as individual members of The Church, most certainly do have this as an obligation and as a command. The Church cannot save. Only Jesus can. The Church is not Jesus. He is building it as His Bride, not as another version of Himself. I do not want my pastor to need to evangelize, as he knows it is on him to equip and prepare me to do that. Did you catch that? People look to their local churches, be they denominational or other, and expect them to do all these great things for Jesus, (a common misconception, since what can any of us “do for Jesus” that He cannot do Himself? He is not bound or limited by our participation or “service” to make sure His Truth gets out there…I mean, The Spirit is His biggest evangelizer known), yet fail to realize that their churches, no matter how well-intentioned, cannot and do not save anyone. We are the oracles of Christ. We are the ones who carry His message of His Father’s Kingdom. Individually. Instead of worrying about this and worrying about inviting someone to your local church to met Jesus, why not do it yourself and invite them into your life? I mean, you are The Church, Chris. I am The Church. Come and fellowship with me and I will show you more of my Jesus than any scripted message on Sunday morning could hope to do. The local churches are not the answer. They are not for the lost. They are not for the purpose of evangelism. We do that. We do. Individually and with His command to do so. His Spirit empowers us. Us. Me and you. Churches are for us, not for the lost. It is ours to go and seek out the lost and introduce them to our Jesus. Somebody on CNN posted a blog last week which says much of what you are saying. It’s amazing what will happen when we don’t put our trust in the things we do, but put all our trust in Jesus instead. Very interesting. 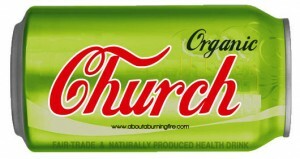 I’ve heard of this sort of thing, but never under the brand of “organic church.” I’ll have to look more into it. At the start, I’m skeptical. Not because I think it’s bad or anything, but because I’ve moved so far away from this sort of thing. It feels…not what I’m into right now. But I want to find out more. Tomorrow, I will officially join the Orthodox Church, a journey I’ve been on for quite some time now. And while it is very structured, and has a very defined Liturgy, etc, there are also many examples of it being “organic”, and some might argue that the OC is indeed an ancient, but organic church, arising out of pages of Acts 2. My wife and I are missionaries serving in Latin America and we are working on something similar in missions. Interestingly enough, that is a very common church model down here. Such a wonderful concept. It is what I’ve been praying for, but have yet to find like minded people in my area. Sounds interesting but there’s actual scripture that supports the importance of a pastor–heck, isn’t it one of the spiritual gifts? You are right. In fact, we have a pastor in our organic church. My husband actually. His spiritual gift is that of a shepherd. But the difference here is that there is no hierarchical leadership. My husband isn’t the boss, nor the top dog. When he is absent, church runs just the same–although we always miss any member of our body who isn’t present. Next Next post: I Love Vandalism! Do You?